Alvas.Audio for .Net is an audio library written in C#. The collection allows C# and VB.Net developers to create applications that play (including mixed audio data), record, edit and convert sound. - record data to any recorder installed in the system. - play data from any player installed in the system. - merge two mono audio streams into one stereo. 5. Convert audio wave stream to mp3 stream. 6. Convert Dialogic .vox (adpcm) stream to Mp3 stream. 7. Checks audio signal silence. 8. Few audio files concatenation. 9. 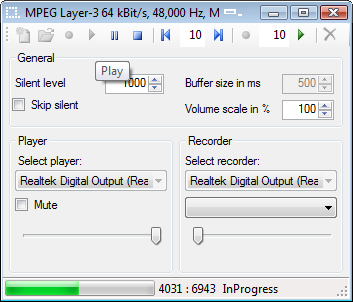 Return the audio stream duration in milliseconds. 10. View the level of the input sound signal. 11. Play, record and convert RAW headerless format (SLINEAR etc). 12. Play and extract audio data from Avi streams. 13. Encode and decode Dialogic .vox (adpcm) format data. Recommended: .Net Framework with Visual Studio .Net 2005 or later (also VS. The CSAudioCDRipper is a .NET component that can rip an Audio CD to AAC, APE, MP2, MP3, Vorbis OGG, ACM WAV, PCM WAV and WMA audio files with built in FreeDB control and ID3 tags editor.